WASHINGTON, D.C. (WABC) -- The Smithsonian's National Museum of African American History and Culture will officially open its doors to visitors later this month. The 13th Secretary of the Smithsonian, Dr. David Skorton, describes the museum that is more than a century in the making as debuting at a time when race and culture differences dominate the national discourse. Objects for the museum were donated by people eager to share parts of history with the public, and it is the only museum in the Smithsonian Institute constructed without an existing collection. 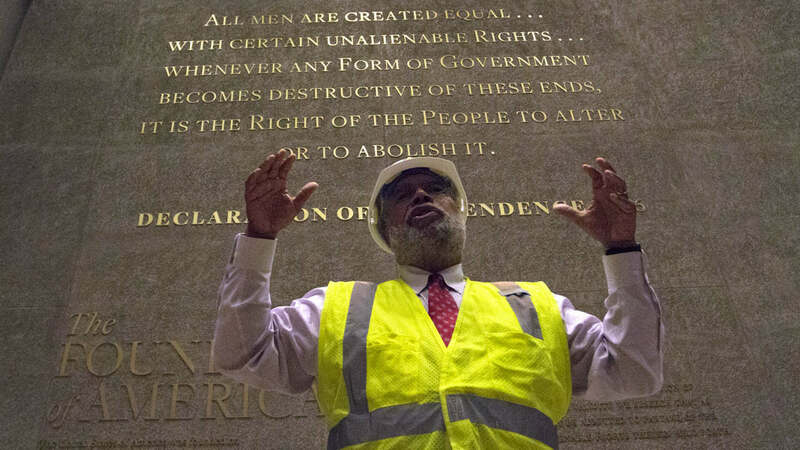 Founding Director Lonnie Bunch said the goal of the museum is bringing people together. "This is a story for us all, not just one community," Bunch said. "This museum looks back, helps contextualize where we are and gives a hint at where we can be." The 19th and newest museum of the Smithsonian will officially open in the nation's capital on September 24. The effort to build the museum began over 100 years ago, in 1915, and included the efforts of presidents and Congress. The 400,000-square-foot museum sits on the National Mall at the corner of Constitution Avenue and 14th Street, across from the Washington Monument. It includes 12 inaugural exhibitions grouped around three main themes: history, community and culture and include an exhibit about the museum's evolution. The unique style of the museum stands in stark contrast to the other marble and columned buildings along the National Mall. The three-tiered building boasts 70,000 square feet of bronze-colored cast-aluminum outer panels weighing 230 tons. The museum is open 364 days a year, closing only on Christmas Day. CLICK HERE for much more on the museum, including what's inside and how to visit, from ABC News.